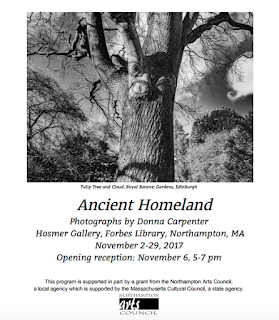 WHERE: Hosmer Gallery, Forbes Library 20 West Street Northampton, MA. Ancient Homeland consists of photographic images captured during repeated journeys that I have made to the Lowlands, Highlands, and Islands of Scotland. These gritty, mysterious, black and white landscapes are thresholds to another world, a world that to me feels different in most every way from day to day life in the United States. I first set foot on Scottish soil in the winter of 2013, when I made a quick overnight return journey from London to Glasgow. That journey, taken on a whim, turned out to be life changing. I felt an inexplicably deep familiarity and ease in Glasgow which led me to wonder about my Scottish heritage, of which I knew next to nothing. Over the course of the past two years I have spent nine months there, exploring the land and her history, often traveling on foot and capturing thousands of photographs in the process. It is from these thousands of photos that I have culled the images in this exhibition. 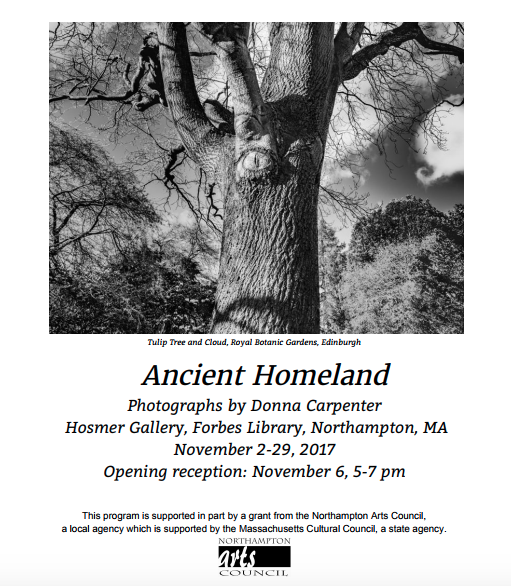 This program is supported in part by a grant from the Northampton Arts Council, a local agency which is supported by the Massachusetts Cultural Council. I am grateful for their support.